The weirdest jump rope game ever! 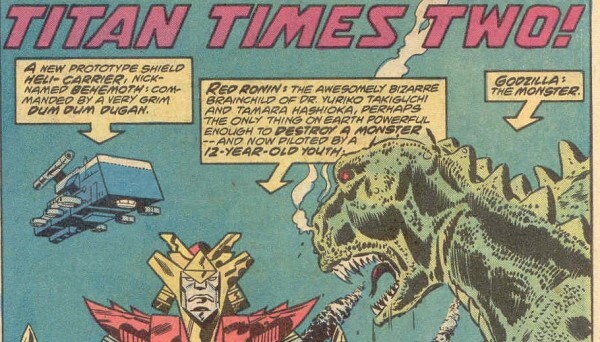 When last we saw Godzilla and Red Ronin, they were just about to fight. Now they do fight! Amazing how that works. Yes, no filler episode this month, it’s a full-fledged battle issue! 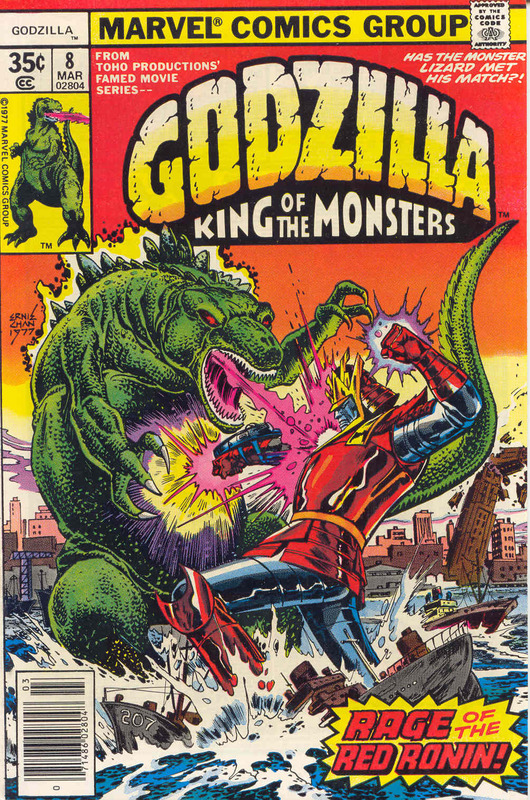 For those new to the Marvel Godzilla comics, make sure you are informed via the Godzilla Marvel Splash Page, and keep up with all the March of Godzilla 2013 marvelness! 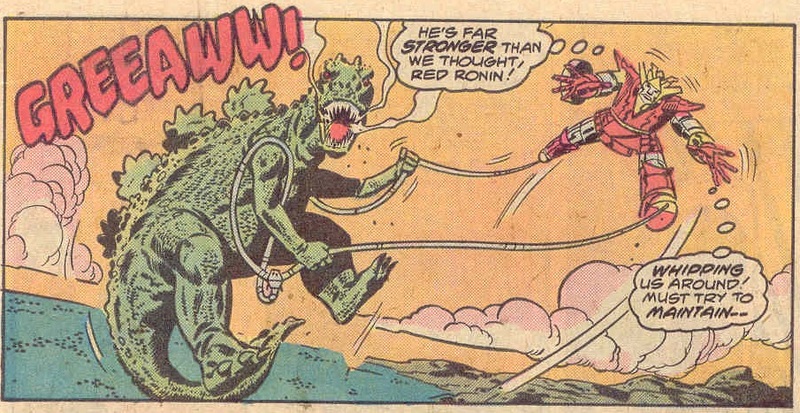 Godzilla and Red Ronin fight! 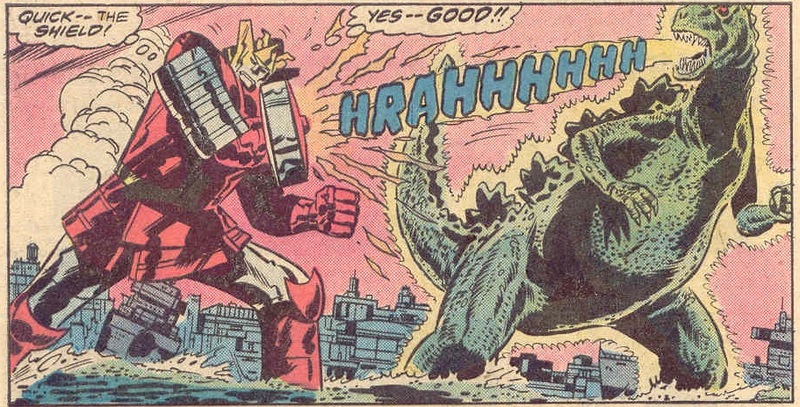 Finally, Godzilla is battling a giant robot like we all demanded! Red Ronin pilot, the 12-year-old child Rob Takiguchi doesn’t want to hurt Godzilla, so he’s reluctant to break out the big guns like the laser sword (aka a light saber) or heavier laser guns. Godzilla is not reluctant to do anything and blasts Red Ronin with his atomic breath. 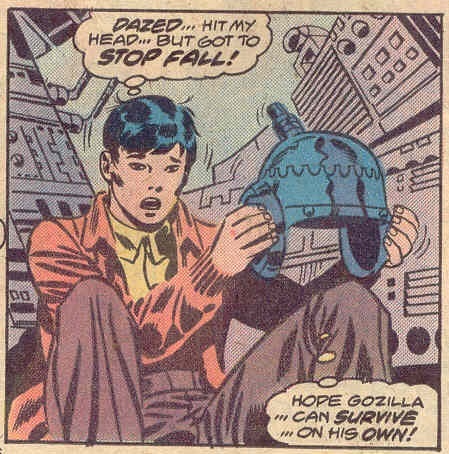 Robert’s unfamiliarity with the controls prevents him from putting up the shields in time, and his roboride is damaged more than it should be. 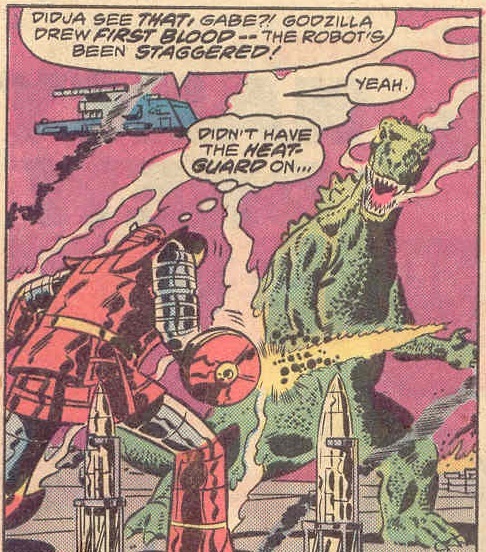 The SHIELD helicarrier Behemoth moves in to fight Godzilla, but Robert uses Red Ronin to attack the helicarrier as a distraction, then grabs Godzilla via magnetic grappling hooks and uses rocket boots to fly away, Big G in tow! Godzilla is literally a cat! 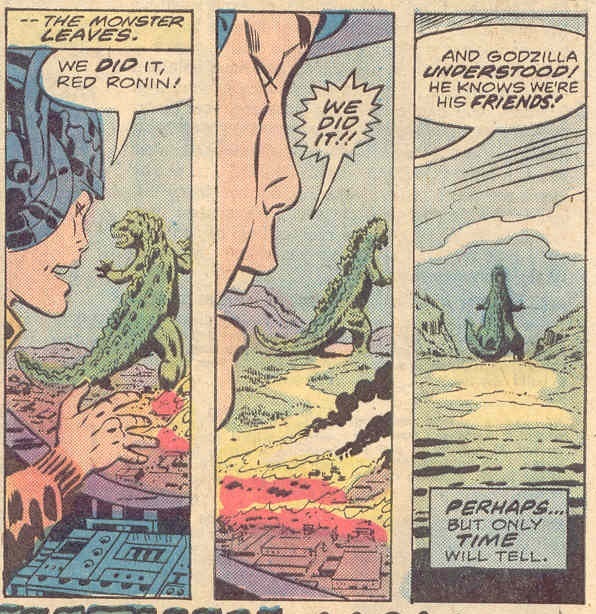 Red Ronin blasts the Behemoth again, then stands in front of Godzilla and points away from San Diego towards the open countryside. Towards land where more people will be, not the ocean where he can find a nice island. D’oh! 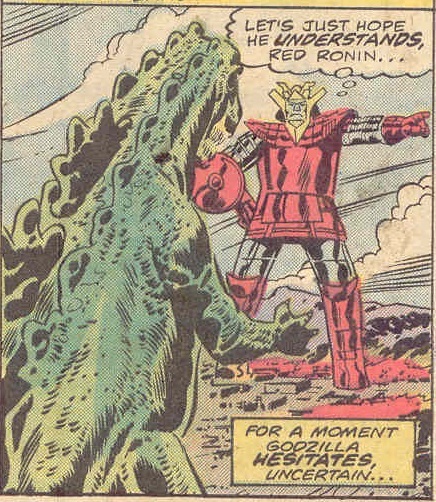 Go home, Godzilla, you’re drunk! Good thing we got this running commentary to explain everything! Rob is the poster child for brain damage now! You won’t like Godzilla when he’s angry. 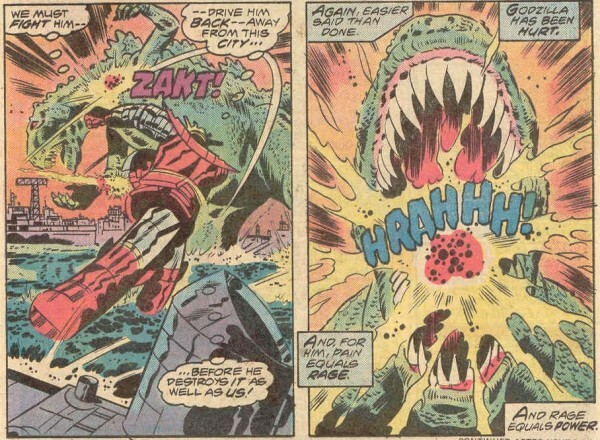 Be happy Godzilla shot right at the shield! Wait a minute, Rob told Godzilla to go further in land instead of back into the ocean??? I know your a huge Godzilla fan, but would you ever do a month centered around Gamera? There is a Gamera month in the long-term plans (which is the main reason I haven’t done any of his films) but like all things it keeps getting pushed back further and further as I try to do a billion things at once. But hopefully sooner than later! I have to double check which Gamera flicks I’m missing, I know I don’t have the newest one. And it would be nice to get the MST3K box set and do a little thing on those as well.